Notes: The First 50 jackets say Modern Radio Records because of a printing error and the second 50 say Modern Radio Record Label. The last 200 have a black and white cover with a different design. 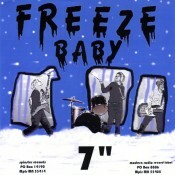 Some copies of this record include a Freeze Baby patch. This is a split release with Spinster Records.